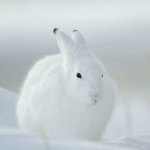 The Arctic hare has many adaptations that help it thrive in the severe conditions of it’s habitat on the North American tundra in the Arctic Circle. Thick fur, low surface area to volume ratio and shortened ears, help conserve energy and body heat. They live in groups of around 200 individuals which often work together to achieve what is needed for their survival in the harsh cold of their environment, including huddling together to conserve heat and to keep each other warm. The Arctic hare has evolved long claws which help it dig through icy and snowy conditions when digging a den or searching for food which their keen sense of smell can detect even through thick snow and ice. These animals are well equipped to avoid the many dangers in their environment as well. Their eyes are placed on each side of their head giving them great visibility, seeing 360 degrees without turning their head as they stand on their hind legs to survey the area. Arctic hares are fast and can accelerate to speeds of up to 30 miles per hour. Their fur adapts to their surroundings, sporting a bright white coat in the winter and changing to a blue-grey in the summer, matching the local rocks and vegetation. AST’s NDA Manager has many adaptations that can help your organization thrive in the sometimes complex environment of non-disclosure agreements. 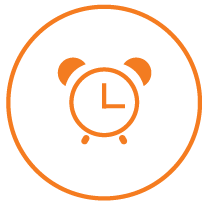 Conserve your energy with time saving features like a smart questionnaire which guides you through the information required, and data merged directly into the appropriate NDA template. Pre-configured reports provide great visibility into upcoming NDA expirations and the side-by-side document comparison feature provides an at-a-glance view of any document changes. The NDA Manager application automates and accelerates the process of requesting, generating, reviewing, approving, and tracking NDA agreements with suppliers, customers, clients, and partners. And, it adapts to your business environment with configurable signature workflows and customizable NDA templates, and the ability to import customer or partner agreements directly into the process. AST’s Non-Disclosure Agreement (NDA) Manager automates and accelerates the process of requesting, generating, reviewing, approving, and tracking NDA agreements with suppliers, customers, clients, and partners. It is a tool developed specifically for managing NDAs, which can be tailored to specific contract process or processes. The Adaptive NDA Application is a critical tool in protecting your company’s Intellectual Property and Technology. Configurable signature routing of NDAs based on your processes. Smart Questionnaire ensures the right NDA is generated every time. Integrated eSignatures make finalizing agreements fast and easy. Consistently current NDAs with expiration tracking and reminders. NDA Manager contains a smart questionnaire, that allows precise generation of the specific NDA needed such as unilateral/one-way, mutual/two-way, end use, non-disclosure, non-compete, or precedent confidentiality agreements. Easily manage NDAs whether partnering on cutting edge development, demoing a proprietary system, or bringing on new employees and contractors. 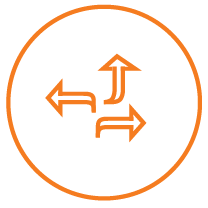 Choose a simple submit and sign approach or automated routing through multiple reviews, edits, and approvals by internal and external Legal teams. The system comes equipped with our vetted NDA forms or you can use the specific language or documents provided by your legal team. The system even allows you to import NDAs from customers or partners who prefer to use their own forms. NDA Manager can take information gathered by the smart questionnaire like IP type, and disclosing and receiving party name, title, contact information, and organizational details, and merge it directly into the appropriate NDA template, saving time and preventing mistakes. You can manage the entire negotiation process right in the application. Internal and External parties can redline existing documents or upload new ones so Legal teams can review, compare, and update versions until mutual agreement is reached. Do you collaborate with offshore vendors, partners, governments, or customers? 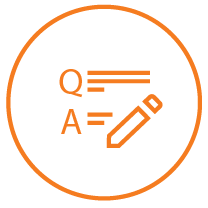 Adaptive NDA has a built in option to initiate Compliance, Export Control or any additional reviews. Sensitive or technical data and ITAR controlled information can be marked for review by additional reviewers so they can ensure the appropriate licensing and agreements are in place. The system automatically captures document change and version history including who changed it and when. And, it provides easy side-by-side comparison between any of the different versions so you can easily see what changed. Do you find yourself wasting time (and ink) with the print-sign-scan-email dance? 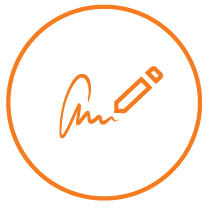 With NDA Manager’s integrated eSignature function you’ll save time, ink, and headaches. Legal advisors, contractors, customers, partners, and other third party users receive email notification when the documents are ready for review and signature. NDA Manager has a unique Live Edit tool which allows multiple people from the legal department to work in a document at the same time. No need to email documents back and forth. Multi-locational collaboration is easy with real-time updates appearing instantly, allowing teams to view, discuss, and update documents simultaneously. And, changes are saved directly to the application, making version control a breeze. With NDA Manager’s discussion feature, you can attach related documentation, generate and store internal and external email communication, and keep internal discussion related to a specific NDA for easy access right with the contract. You can also link a renewal to an expired NDA for ease of reference. Don’t let your NDAs get lost in the shuffle. Ensure you renew all NDAs with your partners, suppliers, employees, and customers in a timely manner. NDA Manager has built in dashboards and reports which facilitate proactive renewals and archiving.